In the last half of 2018, our top priority was releasing faster and catching up closer to Chromium. We succeeded by sticking to a predetermined timeline. Electron 3.0.0 and 4.0.0 were released in a 2-3 month timeline for each release. We are optimistic about continuing that pace in releasing 5.0.0 and beyond. 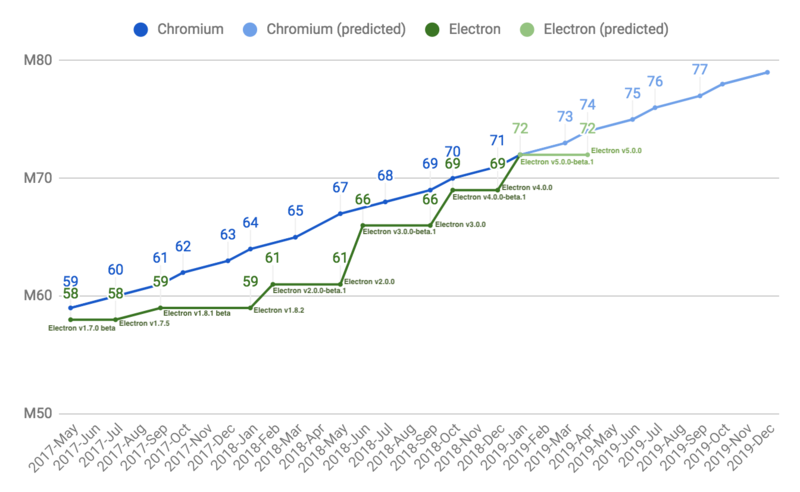 With a major Electron release approximately every quarter, we're now keeping pace with Chromium's release cadence. Getting ahead of Chromium stable release is always a goal for us and we are taking steps towards that.